Cliff was the consummate professional and the perfect person to run the 44,000 member State Bar of Georgia. He had all the qualities necessary to do so successfully: The wisdom of King Solomon, the ability to command respect of General Patton, the patience of Mahatma Ghandi, the diplomacy skills of Henry Kissenger, the temperament of Mother Theresa, the compassion of Dr. Martin Luther King, Jr. and the loyalty of Charlie Brown. 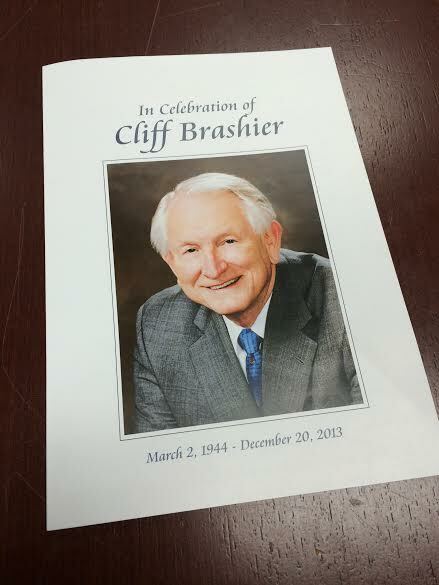 We will never know another Cliff Brashier. If I had any success at all as President, I owe it to Cliff. I never did anything without first running it by him and asking for his input. One of the very sad things I had to do as President was write a letter commemorating the life of Rob Rhinehardt. One of Rob’s favorite scripture verses was Phillipeans 4:8, and if there were ever a scripture that Cliff embodied, it was Phillipians 4:8: “whatsoever things are true, whatsoever things are honest, whatsoever things are just, whatsoever things are pure, whatsoever things are lovely, whatsoever things are of good report; if there be any virtue, and if there be any praise, think on these things. Those things, which ye have both learned, and received, and heard, and seen in me, do: and the God of peace shall be with you. ” This truly captures Cliff’s spirit, as he was all things true, all things honest, all things just, all things pure, and all things lovely. Being President gave me the platform to do a lot of important, meaningful work, and Cliff always thought our suicide prevention campaign was some of the most meaningful work the Bar had ever done. We were literally saving Georgia lawyers’ lives with it. We showed just roughly five minutes of the unfinished suicide prevention video at our Spring Board of Governors meeting at Lake Oconee last year, which included Javoyne Hicks White telling her personal story in the very courageous way she does on the video. She was beautiful and the video is beautiful. Many of you may recall she received a standing ovation. Cliff emailed me after that meeting and said: “Someone asked me, so I checked and last week was my 172nd consecutive Board meeting. Because of the suicide prevention video (even in its early stage), I don’t recall any meeting that was more impressive or important.” Coming from Cliff, that meant the world to me. for an interval, somewhere very near, just round the corner. All is well, Cliff. We love you and miss you.